Green Valley, Arizona offers a unique concept in active retirement living unlike any other retirement destination in the country. The Green Valley population of approximately 12,000 households is comprised almost entirely of 55+ aged residents spread throughout a handful of 55+ active adult communities. Some of the neighborhoods in Green Valley are small age-restricted communities of less than 100 homes, whereas other neighborhoods contain over 1,000 residences. There are many neighborhoods to choose from in Green Valley s 55+ active adult communities, providing ample choices for homebuyers. Whether you are looking for a small condo in one of Green Valley s intimate age-restricted communities or a luxurious single-family home overlooking the golf course in a large-scale Green Valley active adult community, there is something for everyone. Home prices in Green Valley, Arizona are very reasonable and homebuyers can often find deals at Green Valley active retirement communities for less money than other areas in Arizona. 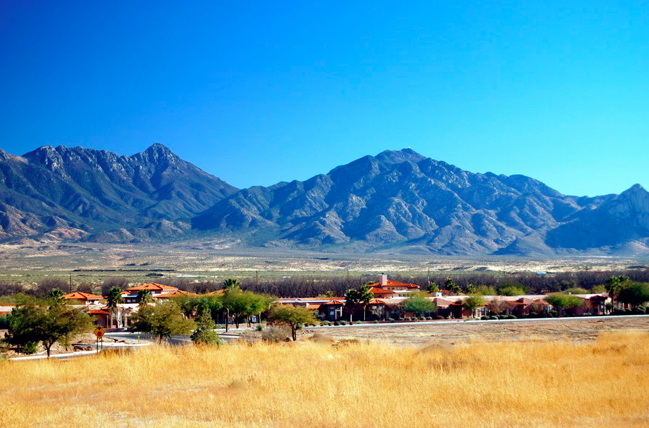 Situated below the Santa Rita Mountains, Green Valley is located along the western side of the Santa Cruz River and has a total area of 26.3 square miles. It is situated 20 miles south of Tucson and 40 miles north of Nogales, Sonora, Mexico. Its average total snow, sleet, and hail is just 1.0 inches annually. In January, the average daily high is 67.1 degrees. Unlike most 55+ active adult retirement communities in the country where residents are limited to the amenities and activities of their own community, nearly all of the residents of Green Valley, Arizona are part of a large conglomerate of interconnected amenity and recreation centers know as Green Valley Recreation (GVR). In fact, there are currently 13 recreation centers in GVR s 55+ active adult retirement communities. Residents of any of the communities enjoy the use of eight golf courses, five fitness centers, 13 swimming pools, 17 tennis courts, hobby and craft studios, and many other desirable recreational facilities. One of the reasons so many retirees move to a Green Valley 55+ active adult retirement community is the lifestyle. There are over 100 clubs and interest groups throughout the Green Valley active adult communities. There are also many events and activities specifically tailored for older adults. Regardless of whether your interests include golf and tennis or cards and crafts, there is something for everyone at Green Valley s active retirement communities. GVR activity coordinators are continually planning a fun and exciting calendar of events that are sure to keep the residents of Green Valley, Arizona active adult communities busy 365 days a year. Compared to the rest of the country, Green Valley s cost of living is 2.9% lower than the national average. The median home cost in Green Valley is $140,400 and property taxes are collected at the county level, which Green Valley is Pima County. The average property tax is lower than the rest of the country and the sales tax is 6.10% while the highest state income tax rate is 4.57%. There are about 21 healthcare facilities within close proximity to all of Green Valley's active adult communities. The University of Arizona Medical Center, Carondelet St. Mary s Hospital, Tucson Medical Center, and Carondelet St Joseph's Hospital are located within a 30-mile radius of Green Valley.